Welcome to the third article in our A Generation Past series, where we talk about cards from old booster packs that have left their mark on the game! If you wish to recall the past two articles, please click on the following links! Before we kick off Part Drei, let’s have our first card reveal for the brand-new G Technical Booster: The RECKLESS RAMPAGE! A fate to burn fleetingly, and vanish. :[Choose a card from your hand, and discard it] When this unit is placed on , if the number of cards in your opponent’s bind zone is one or more, you may pay the cost. If you do, draw a card. We will continue to feature new cards in the next column. Do stay tuned! Let’s move on with the topic of A Generation Past. No surprises here. I actually thought of this card first before anything else, but as I started writing, I began to remember other notable Kagero units that have made their appearance over the years. In the end (pardon the pun), I decided to go with this beast. The competitive environment had already entered the Limit Break era when Dragonic Overlord the End first entered the scene. Arguably, not having a Limit Break ability helped it out a lot despite the increased power that the Limit Break cards were bringing to the table, as it could unleash its fearsome power without restraint. Dragonic Overlord the End was also one of the first cards in the game to feature the Crossride ability, giving it unparalleled offensive and defensive capabilities. Coupled with an offensive retire-based deck build that aimed to remove key cards from the opponent’s back-row consistently, this card virtually dominated its competition without even having to break a sweat. Eventually, the power of this card waned as some of the more powerful Limit Break cards began to appear (like Star-vader, Chaos Breaker Dragon and Blue Wave Dragon, Tetra Drive Dragon), but recently it made a small comeback with G-BT01 Generation Stride, with Dragonic Overlord “The X” being introduced. 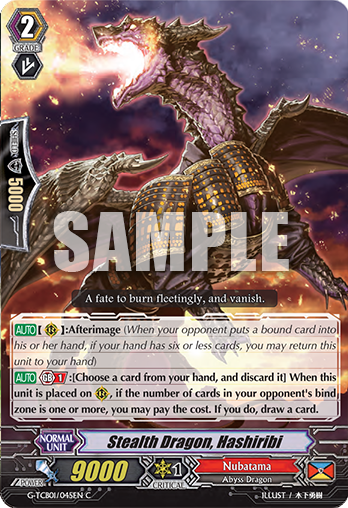 Blazing Core Dragon, Blazing Flare Dragon: Being able to ride up a grade one turn early has always been a big thing. Blazing Core Dragon offered players a chance to do it, as long as they had the right cards in their hand. The advantage gained when this ability is pulled off slowly accumulates, as the player can start to perform Twin Drive! earlier while also retiring the opponent’s rear-guards with Blazing Flare Dragon’s effect. Seal Dragon, Blockade: A true oldie, Blockade never did do well in the tournament scene but it still deserves mention as one of the first cards in the game to prevent Intercepts. It even got an upgrade later in Hellfire Seal Dragon, Blockade Inferno and the Seal Dragon archetype. Perdition Dragon, Vortex Dragonewt: One of the powerhouses of the Legion era that can deal direct damage to the opponent while also punching holes in the opponent’s field. Another no-brainer here – Dragonic Kaiser Vermillion has hands-down been one of the most iconic cards that have been released. It was the first to be able to attack multiple units in a single attack, and that has always been a big deal. It causes a problem for decks that cannot replenish their field easily, and forces decks that can to assign resources to deal with this effect. It helped to check popular decks of the time, like Gold Paladin and Royal Paladin, just by sitting on the vanguard circle. As the game progressed, we then had access to Dragonic Kaiser Vermillion “The BLOOD”, the upgraded form of Dragonic Kaiser Vermillion, which boasted a more powerful version of the already-strong effect. It had a good run as a competitive deck, but slowly faded away as other decks began to rise. Recently, Dragonic Kaiser Vermillion made a small comeback with one of the new cards in the Cardfight!! Vanguard G series that essentially allows the player to clear out the opponent’s front row every turn: Dragonic Kaiser Crimson. A player in Malaysia even piloted a deck using Dragonic Kaiser Crimson, and helped his team achieve 3rd place in the Spring Fest Team League Tournament! Click here to check out his decklist! With that, we’ve come to the end of the third article in our series. In the next article, we’ll be taking a look at the rest of the Dragon Empire clans Nubatama, Murakumo and Tachikaze, so stay tuned! It’s just two weeks to go before the end of 2015! Hope you’ve had a wonderful year with your family, friends, schoolmates and colleagues… and with Cardfight!! Vanguard, of course! As we prepare to head into 2016, I’m sure everyone has dreams and aspirations for the future – things you want to accomplish, places you want to go et cetra, so do share with us what your new year’s resolution is! Tweet to us at @cfvanguard_en and hashtag #cfvanguard2016wish so we can see it! Have a wish for Cardfight!! Vanguard in the new year? Or maybe you have a brilliant idea for a new card that you want to share with us and the world? Perhaps you’d like to declare your intentions to win the next World Championships?! 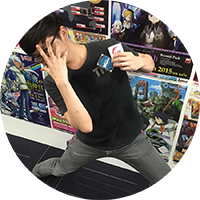 Drop us a line on Twitter, and I will feature some of my favourite #cfvanguard2016wish in the next Cardfighters Column! Selected wishes will be featured in the next column. Thank you for very much for your time, and let’s meet again next Friday in the Cardfighter’s Column!